This section includes a series of fact sheets and links to key Australian and international organisations involved in complementary and integrative medicine. 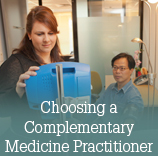 Information for Consumers, including the fact sheets: Choosing Complementary Medicine; Choosing a Complementary Medicine Practitioner; Talking to your Health Professionals; The Safety of Complementary Medicines. A range of websites that provide information related to complementary and integrative medicine information, including research, regulation and peak bodies of complementary medicine modalities. These links have been provided as a public service only and NICM does not endorse any content that is shown on third party sites.